A risk and vulnerability assessment is a comprehensive examination of a company’s physical facilities and operational procedures. The assessment identifies critical assets, threat potentials, and vulnerabilities in relation to threat potentials. It focuses on many different areas of the facility, including vehicle access, parking, access control, office space, conference rooms, storage/manufacturing areas, closed circuit TV, lighting, mail handling, utilities, intrusion detection, communications, and emergency preparedness. The assessment procedure includes the assessor reviewing the building’s physical components and procedures with management, as well as completing a thorough tour of the building(s) and campus. At the conclusion of the assessment, we deliver a confidential, user friendly written report containing observations, existing positive security measures, best practices, and specific recommendations for modifications or improvements in up to 250 individual standards among approximately 30 profile areas, all of which are tailored to the assessed facility. The report is designed to provide management with significant and purposeful information that can be easily referenced and interpreted. We also assist in finding solutions that balance optimal security measures with business culture and budgetary allocations. Once management has reviewed the report, a meeting with the assessor can be scheduled for questions and clarifications. Our on-site security assessments are conducted by an ASIS certified Physical Security Professional (PSP®) with extensive experience gained as a member of the first state police-based risk and vulnerability assessment unit in the country. We have conducted hundreds of security assessments throughout Pennsylvania, as well as nationally and internationally. Today’s world presents very diverse threats to business and government, both internally and externally. Our security assessments are designed to prevent and/or mitigate many forms of loss, including internal/external theft; vandalism; acts of terrorism; criminal actions; active shooter; and natural & manmade emergencies. 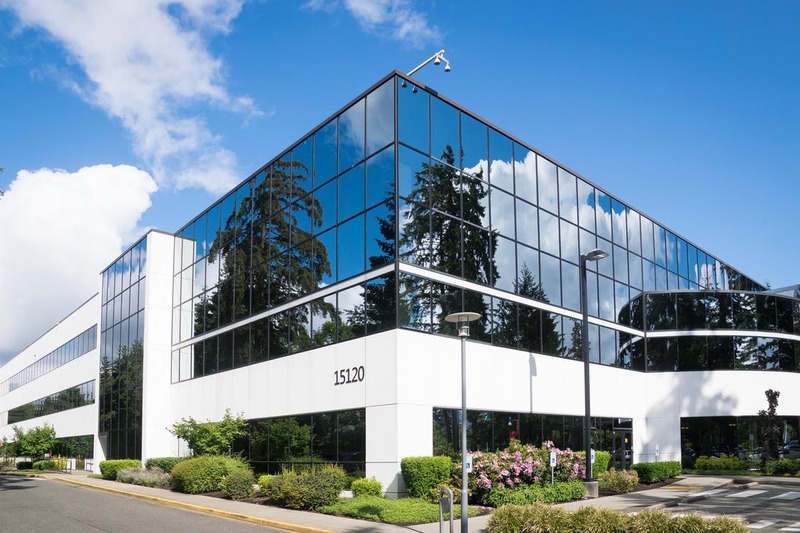 A security assessment of your facility is a wise investment in the safety of your customers, employees, and surrounding community, as well as your corporate reputation. VSG has formed an exclusive partnership with the EdJIT mobile content delivery platform to provide customized, mobile-first, continuous education to all business staff directly onto their mobile devices or PC’s. 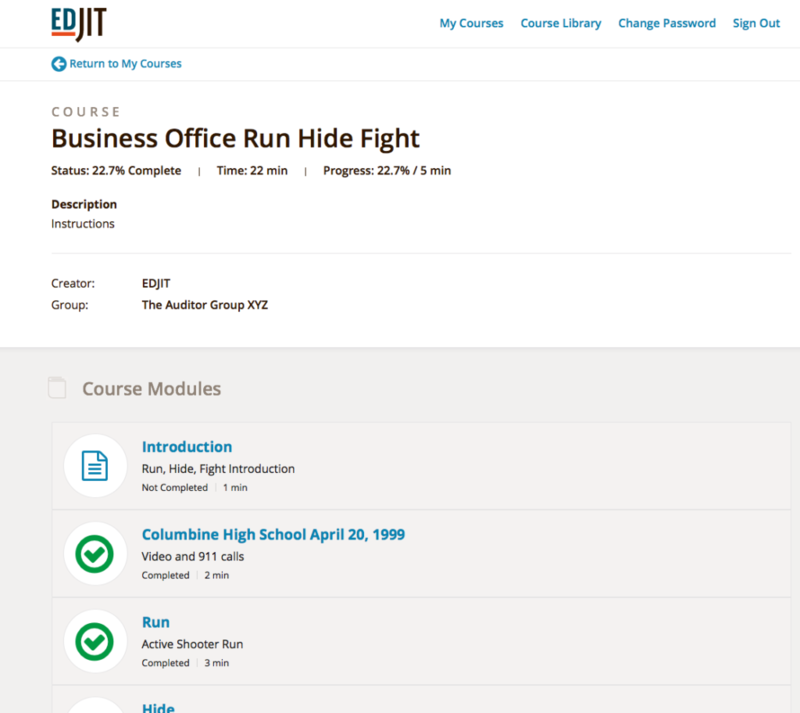 Not only will your employees have access to the latest courses on up-to-the-minute security protocols, the rapid content creation features of the EdJIT platform allow VSG staff to create custom training modules right down to the individual facility in real time. Training and emergency courses include nuances and vulnerabilities, distinctive to a particular building, that employees need to be aware of in emergency situations. These details are presented to staff through creative and easy to follow modules, including drone and point-of-view videos which make emergency protocol implementation very simple. Items such as safe rooms, doors & windows, locks, exits, terrain, utilities, etc. that vary from building to building are included in emergency protocol modules which can be accessed via desktop or mobile device. These can be combined with simplified instructions, taken from a company’s all-hazards plan, that employees can easily access and follow in an emergency. Nowhere in the marketplace does such real-time, customized intelligence exist in conjunction with expert, reliable security consulting services. 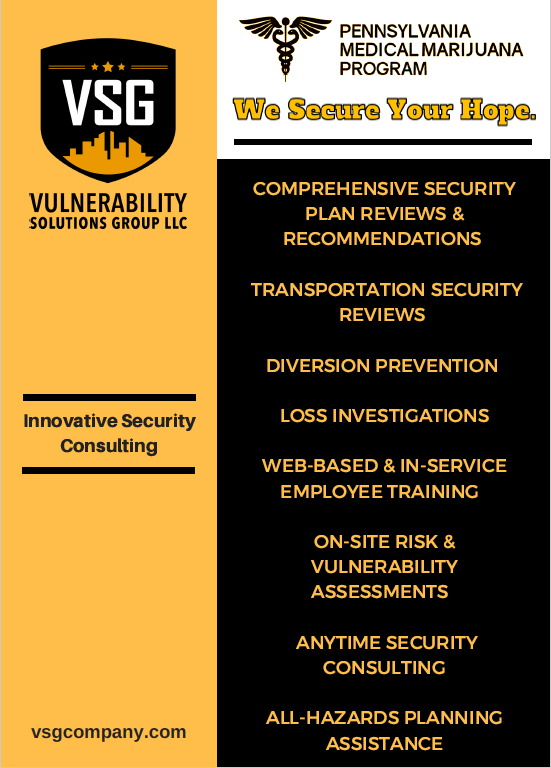 Security is the responsibility of everyone within a company, and VSG equips all personnel with the tools needed to identify, report, and monitor any threat that may exist within a facility. This ongoing instructional tool set helps ensure that companies not only reduce their vulnerabilities, but uniquely enables them to instruct their personnel, sustain security best practices, and most importantly, change their corporate culture to factor in security measures as part of everyone’s responsibility. The R.I.S.C. 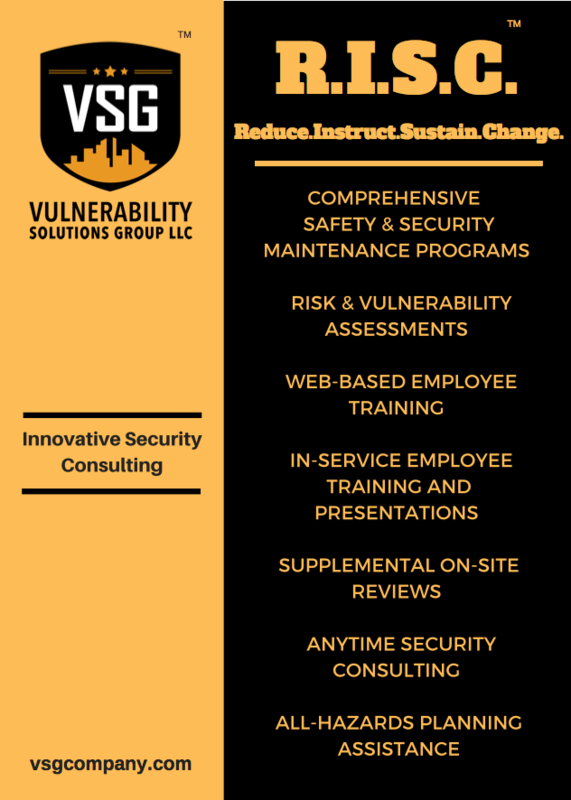 program offered by Vulnerability Solutions Group, LLC is the first program of its kind developed specifically to address the ever-changing security variables which confront today’s workplace. Instead of focusing merely on one aspect of a company’s security posture and emergency response, the R.I.S.C. program is a comprehensive approach which emphasizes the importance of four equal components in maintaining the safety and security of your work environment. Our fast-paced world is continually changing and the comprehensive nature of the R.I.S.C. 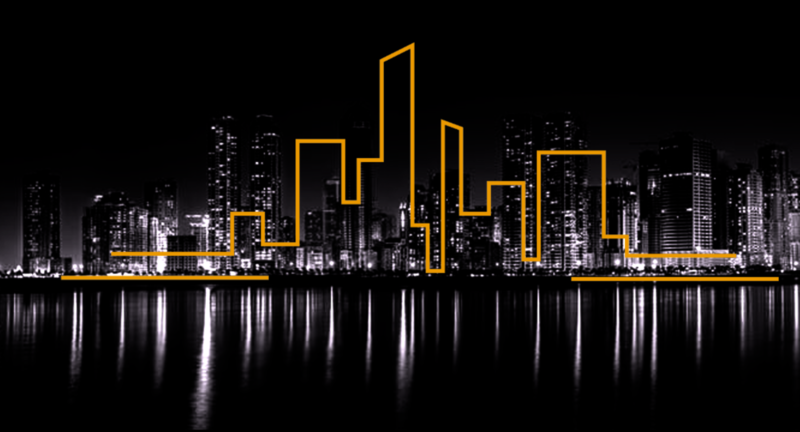 program enables your security and emergency protocols to keep pace with changing facilities and personnel, as well as new and emerging threats. By incorporating on-site risk & vulnerability assessments, web-based training, in-service presentations, supplemental on-site reviews, “anytime consulting,” and all-hazards planning assistance, we are able to provide a complete and progressive product which can be updated as necessary. 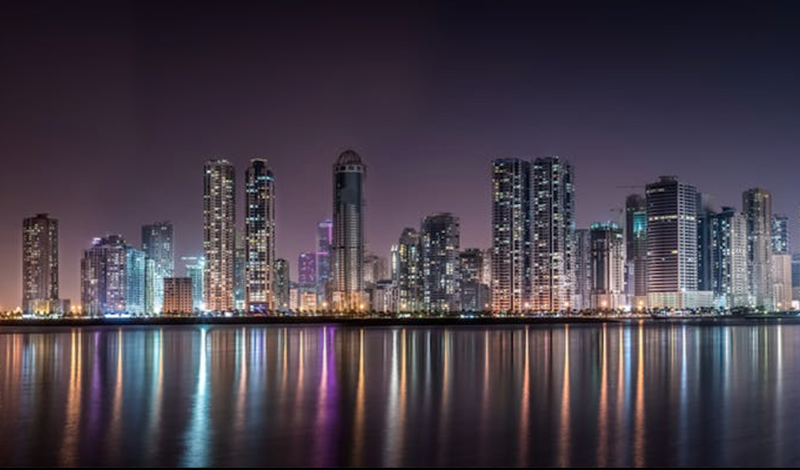 Our services will not only meet the needs of management, but will reassure employees and their families that your company is proactive in affirming their safety and security. It’s not often that a company has the opportunity to enter an industry on the ground floor. It is an industry with endless potential to make a real difference in the lives of children, elderly, and those with chronic pain. Because of the very limited number of permits issued, as well as the heavy regulation once operational, this opportunity requires error free planning and execution. As a team of police professionals with over 75 years of experience in Pennsylvania, we are able to provide sound and unique advice in developing the security plan for your growing and/or dispensing operations, while meeting and exceeding the requirements established by the Pennsylvania Department of Health. Utilizing a blend of security and protection operations, software design/development, and process improvement creativity enables us to provide advanced direction in your modern operations. Additionally, because our team has worked with thousands of police professionals and prosecutors throughout Pennsylvania, we are able to communicate with these agencies in a manner that can benefit your operation when it comes to emergency response, protection, and community engagement. Once your facility is operating, our expertise in risk & vulnerability assessments will assist in the prevention of theft and diversion, both internally and externally, as well as mitigate all existing and emerging threats to your facility, personnel, and customers. If theft or diversion is suspected, VSG is a licensed private investigating agency and will conduct a professional investigation of the incident, assist in amending operation plans, and complete the preliminary and final reports for submission to the Department of Health. 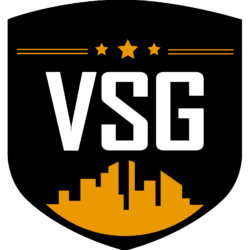 From the time of permit application to the day of your first Department of Health audit, rest assured that VSG will provide you with unmatched expertise and guidance to provide a secure and compliant operation while your business thrives.